For as long as I can remember, my favorite meal of the day has always been breakfast. I could have breakfast food for every meal, every day! And while I do enjoy a hearty, healthy bowl of oatmeal and fruit, I much rather make something a bit more decadent — like pancakes. 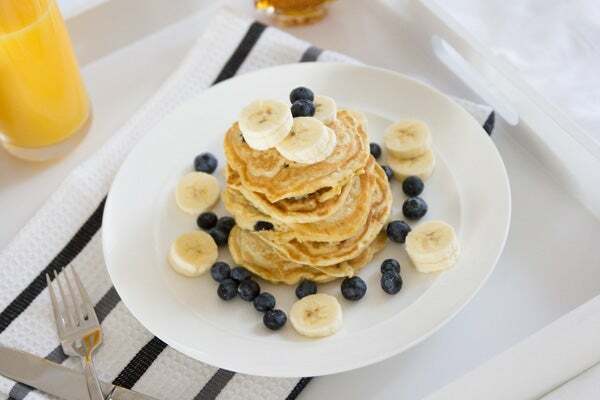 My pancakes of choice are Blueberry Pancakes by America’s Test Kitchen, but I add a few extra ingredients, naturally, like bananas or chocolate chips ... or both. I like to enjoy my pancakes in bed with my mismatched PJs and a glass of OJ, even if it's 2 in the afternoon. And you can bet that I'm color-coordinating my spread. Even when cooking, I can't help but make sure my place mat matches with the fruit's color palette. For some afternoon noshing at home, give these flapjacks a try. You might never get out of bed, too. 1. Mix the milk and lemon juice together with a whisk, then set aside to thicken. 2. Mix the flour, sugar, baking powder, baking soda, and salt together. 3. Mix the egg and melted butter into the milk. 4. Make a hole in the center of the dry ingredients in the bowl. Pour the milk mixture into the hole and whisk gently. 5. Heat a 12-inch skillet over medium heat and pour ¼ cups of batter into three spots. 6. You can then add either the blueberries or chocolate chips or both. Wait about two minutes to flip to the other side. This recipe makes up to 16 pancakes, but you can cover the batter and store in the fridge for the next day if you're not feeding a family of four.